Service consists of the removal of the flat tire for the Covered Vehicle, and it's replacement with the mounted spare tire located with the Covered Vehicle, up to $150 per occurrence. The truck program for flat tire assistance excludes coverage for trailers. If your keys are locked inside the Covered Vehicle, assistance will be provided to gain entry into the Covered Vehicle up to $100.00 benefit limit. In the event there are no keys found, and a replacement key is needed, you will be covered up to the maximum benefit amount of $100.00 for the total cost of lockout service and a new key. A pull start may be available for the covered vehicle in lieu of a jumpstart, if available, up to $100 per occurrence. Activation of the plan begins 15 days after the date of purchase. Pre-existing conditions prior to membership activation and/or while membership is suspended. Service for any trailer which must be separated from the tractor. Service to vehicles with expired safety inspection sticker(s), license plate sticker(s), and/or emission sticker(s) where required by law. Vehicles located at storage facilities. Cost of parts, replacement tires, fluids, lubricants, cost of installation of products, material, and additional labor relating to towing. Priming of the fuel system. Any fees relating to the mounting of a drive shaft. Tire repair on Steer or Trailer Tires. Tire replacement at any location other than a roadside disablement site. Any and all taxes, fines and tolls. Non-emergency towing or other non-emergency service including but not limited to mounting or removing of any tires, snow tires, off-road tires, chains or similar items. Shoveling snow from around a vehicle. Service when a vehicle is snowbound in unplowed areas such as snow banks, snowbound driveways or curbside parking. Damage or disablement due to flood, fire, or vandalism. Towing from or repair work performed at a service station, garage, truck stop with on-site repair facility, dealership or repair shop. Service on a turnpike where only State service providers are authorized to operate. Service on a vehicle that is not in a safe condition to be towed or serviced or that may result in damage to the vehicle if towed or serviced. Towing by other than a licensed service station or garage; vehicle storage charges; a second tow for the same disablement. Towing as a result of an accident. Towing for the purpose of disposal (e.g., salvage facility). Towing of vehicle off a boat dock or marina unless such facilities are used for intermodal and ocean freight purposes. Transportation for the member to the Covered Vehicle for service or from the Covered Vehicle to another destination after service has been rendered. Towing from any location other than a roadside disablement site. Covered services may not be requested from a residence, dealer or repair facility. Coverage shall not be provided in the event of emergencies resulting from the use of intoxicants or narcotics, or the use of the Covered Vehicle(s) in the commission of a felony. Repeated service calls for a Covered Vehicle in need of routine maintenance or repair. Excessive claims for covered services will result in cancellation and may result in non-renewal of the membership. Excessive use is defined as using a combination of the following services; towing, jumpstarts, mobile mechanic, fuel delivery, 3 times within a 3-month period. More then one disablement. Only one (1) disablement during any seven (7) day period will be accepted (subject to "excessive claims"). Services received independently from RoadsideMASTERS.com without prior authorization from RoadsideMASTERS.com. Jump-start service that exceeds the benefit limit of $150. THIS IS NOT A ROADSIDE ASSISTANCE REIMBURSEMENT PROGRAM. 24-HOUR EMERGENCY ROADSIDE ASSISTANCE SERVICE – Just call the TOLL-FREE Number, 1-800-395-4908, and a service vehicle will be dispatched to your assistance. Important: Please be with your vehicle when the service provider arrives, unless it is unsafe to remain with the vehicle, as they cannot service an unattended vehicle. When calling for dispatch service and it is no longer required after calling for service, you must contact RoadsideMASTERS.com at 1-800-395-4908 immediately within the first twenty (20) minutes to cancel the dispatch request (see D. Suspension in the membership handbook). Service provided must be a covered benefit under the terms and conditions described in this agreement. Note: 24-Hour Emergency Roadside Assistance Service is designed to assist members whose Covered Vehicles are disabled as a result of unavoidable circumstances. It is not intended to be a substitute for vehicle maintenance or repair. Towing assistance will only be covered from a roadside disablement location. Covered services may not be requested from a residence, dealer, bus stop with on-site repair facility or repair facility. Excessive claims for services will result in cancellation and may result in non-renewal of the membership. Excessive use is defined as using a combination of the following services; towing, jumpstarts, mobile mechanic, fuel delivery, 3 times within a 3-month period. The 24-hour roadside assistance services are available to you at no cost per occurrence for covered emergencies as defined in this document. You are responsible for any non-covered expenses. Your 24-hour roadside assistance service activates fifteen (15) days after date of purchase and will continue for the period of time you have selected and paid for, unless cancelled. Your Membership Card is issued within your account at http://www.roadsidemasters.com/memberlogin/, 24 hours after you first register for the program. This card is invalid if the policy for which it was issued lapses or is terminated. Login to your account to print your Membership Card. If you have lost your Membership Card, you can download and print a new copy by logging into your account at http://www.roadsidemasters.com/memberlogin/. Please keep your card with you at all times when requesting Emergency Roadside Assistance. If you need to update your information including the Covered Vehicle on your membership, please login to your membership account at http://www.roadsidemasters.com/memberlogin/. 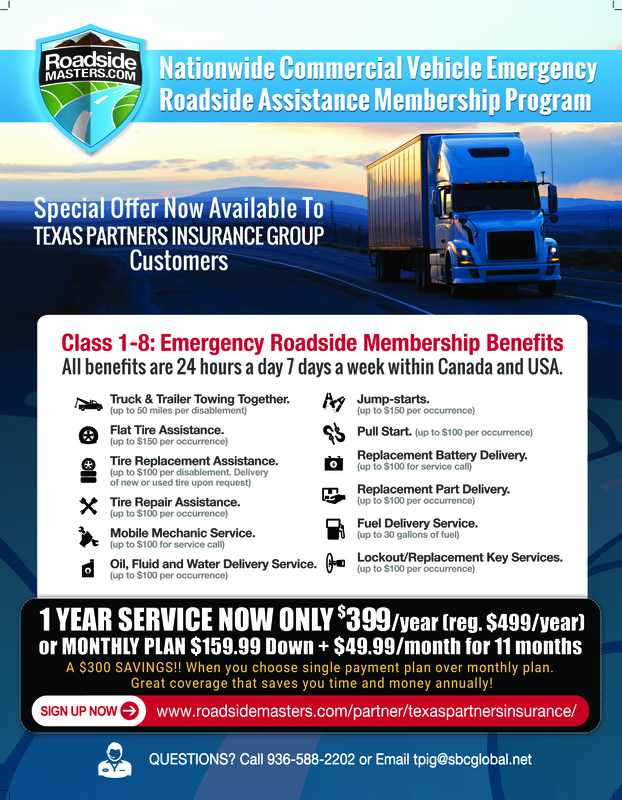 If you have any questions contact RoadsideMASTERS.com Membership Department at 1-800-395-4908 or email membership@roadsidemasters.com and we will assist you. The Member Area (Login Portal) is also located on the top right of the RoadsideMASTERS.com website. All benefits and services are provided by Roadside Transportation LLC., d/b/a RoadsideMASTERS.com, administrative offices at 2665 South Bayshore Drive, Suite 220, Coconut Grove, FL 33133. Referred to as “RoadsideMASTERS.com” throughout these Terms and Conditions. 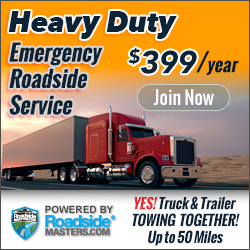 In the event that 24-hour roadside assistance service is not obtainable through RoadsideMASTERS.com, you will receive an authorization number from RoadsideMASTERS.com to obtain service from another service provider. Upon your written request, including the authorization number and validated receipt(s), you will receive a refund (if any) of payments made for services received independently according to the coverage limits outlined in these terms and conditions. You must first contact RoadsideMASTERS.com for authorization to obtain services independently of the program. THIS IS NOT A ROADSIDE ASSISTANCE REIMBURSEMENT PROGRAM. You have the right to file a compliment or complaint by submitting a written letter to RoadsideMASTERS.com’s Customer Care Department, contacting a representative by calling 1-800-395-4908, or e-mailing to membership@roadsidemasters.com. Cancellation, Suspension and Refund terms are located in the latest updated commercial vehicle membership handbook (C. CANCELLATION and D. SUSPENSION). 1. Except in Wisconsin, this is not an insurance contract. 2. This is not an Automobile Liability or Physical Damage insurance contract.